NHS & Care Homes - DiscreteHeat Co. Ltd. The new EasyClean LST (and EasyClean† for larger open spaces) has been developed in co-operation with the NHS Estates and Infection control departments, to provide a simple, safe, energy efficient and above all hygienic heating solution for the HealthCare market. Unlike LST (low surface temperature) radiators, the EasyClean has no slots or grilles for harmful bacteria such as C. Difficile and MRSA to enter and incubate, and is simply wiped free of infection when mopping the floors. No cases or covers to remove, no special tools and keys, no deep clean teams. Unlike UFH (under floor heating) the EasyClean is fast and responsive to changes in heating demand, ensuring maximum patient comfort and minimal running costs. Being ‘above ground’ the EasyClean is a simple retro-fit to existing systems, and will not lift floorings or develop an undetectable leak. In addition it will not cause the ‘tired leg’ syndrome experienced by hard working staff standing on heated floors all day. 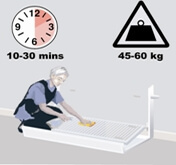 Unlike overhead radiant panels, the EasyClean LST does not create the ‘hot head’ effect that can lead to discomfort and behavioural problems in vulnerable patients. In addition, as the EasyClean LST operates at low water flow temperatures, it is much more energy efficient and produces an all-around comfortable spread of heat, with no risk of scalding water leaking onto personnel or equipment. 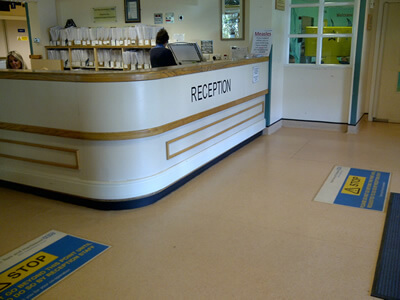 The EasyClean LST system has already been installed on several major NHS projects, and specified on dozens more. When Dr Barzo Faris, Infection Control Lead at NHS Trafford General MRI, approached DiscreteHeat, he had one aim – to reduce the spread of infections such as MRSA & C.Difficile in the hospital. 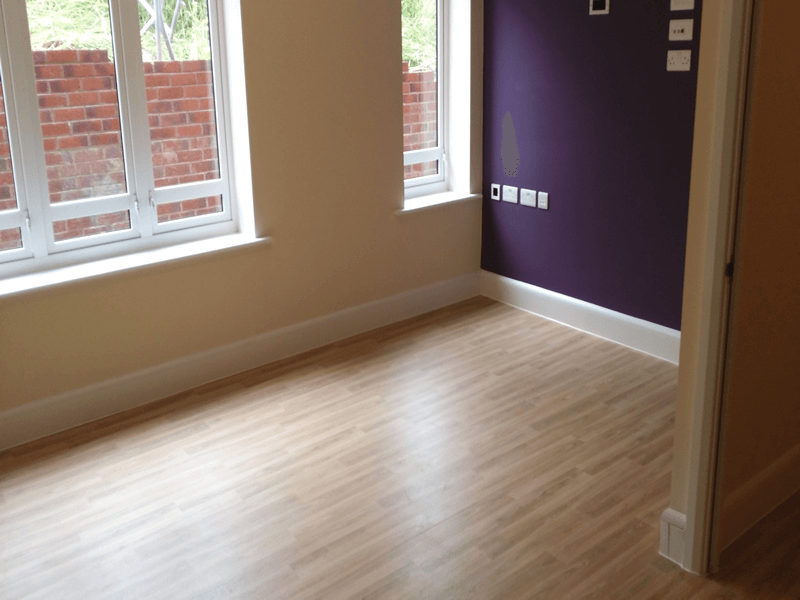 Dr Faris recognised that the ThermaSkirt system, despite being a product aimed at the residential market, had a number of advantages over traditional LST radiators commonly found in NHS facilities. He had discovered that one of the last remaining and most difficult areas to prevent from spreading infections were the radiators and their LST covers. This was because radiators draw cold air up from the floor – where most of the bacteria can be found- and into and through the grilles and fins on the radiator, which then warms the air and sends it circulating up & around the room. The natural detritus and dust that collects behind and between a radiators’ panels, is the ideal breeding ground for virulent organisms such as C.Diff and MRSA and the convection currents radiators rely on to distribute the heat, is the perfect delivery system for microbiological infections. Dr Faris uncovered that in some instances, the LST radiator covers had not been removed for a deep clean for over 8 years! This was due to the necessity for a physically fit and well ‘armed’ deep clean team to remove the metal covers which required security tools, and inevitably blocked off the corridors or cordoned off parts of the ward. Even then, the double panel radiators were practically impossible to clean thoroughly between the panels without being completely removed, and dipped, or in some instances thrown away as being uneconomical to clean compared to replacing. Dr Faris asked if DiscreteHeat could develop a more secure and hygienically sealed version, which could replace the existing LST radiators and the bulky covers. Additional measures such as impact and vandal resistant, and importantly anti-ligature were also high on the ‘wish list’. 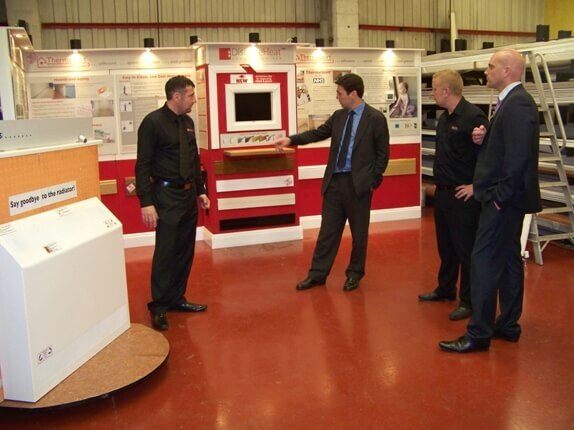 After 12 months design and development, including several trial installs, the ‘EasyClean LST’ was launched. With more and more elderly and learning disabled persons requiring extra care, either in their own home or in dedicated centres of excellence, the EasyClean heating system is the ideal product to provide service users with a clean, comfortable and safe environment. Available in a wide range of familiar profiles and colours the system can provide clients with a low maintenance, hygienic and energy efficient radiant heating solution that takes up no wall space and provides no risk of tripping or impact hazard. Being ‘above ground’ the system is fast and responsive without overheating that can lead to distress and challenging behaviour. 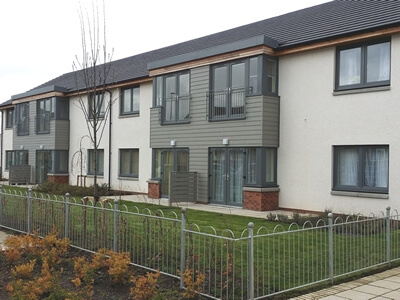 The EasyClean system has recently been installed in the Iris Murdoch Dementia Services Development Centre in Stirling, and in the Better Bedrooms display in Warrington. With a completely sealed floor and wall mounting, the EasyClean provides no ingress pathways for fluids and solids, and thus will not harbour bacteria that can create infection or odours. In addition, for medium or high secure units, the system is naturally anti-ligature and is available with a profile designed for anti-pick mastic. 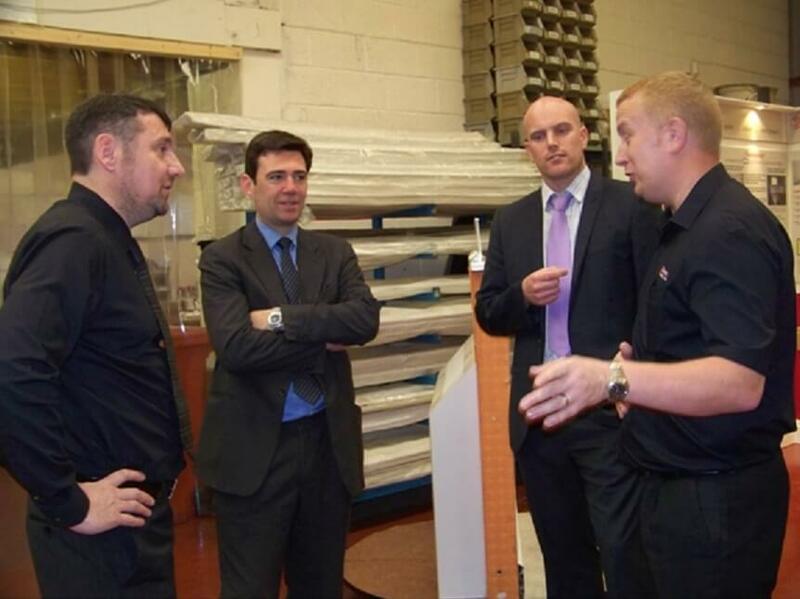 Shadow Secretary of State Andy Burnham MP, made a special visit to DiscreteHeat Headquarters to see the ThermaSkirt product and further understand its benefits to the Health Service. Also in attendance was Lee Panter from the NHS Technology Adoption Centre (NTAC) who is working with the company to further the application, understanding and take-up of the ThermaSkirt system in the health care sector. 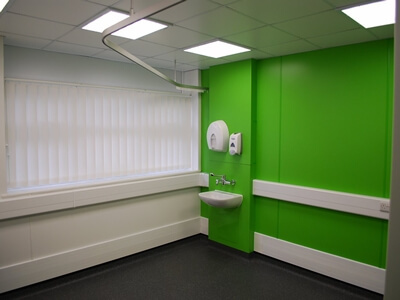 ThermaSkirt has been specified on several new build and refurbishment projects in the NHS, but the scope for wider use of the product is huge. Eliminating conventional radiators as the main remaining source of the spread of hospital acquired infections (HAI’s) would offer considerable savings for the NHS and also provide a significant improvement in patient care. HAI’s are estimated to cost the NHS an incredible £1billion a year, and the cost of correctly cleaning radiators in accordance with hospital guidelines adds another £1billion to the bill. 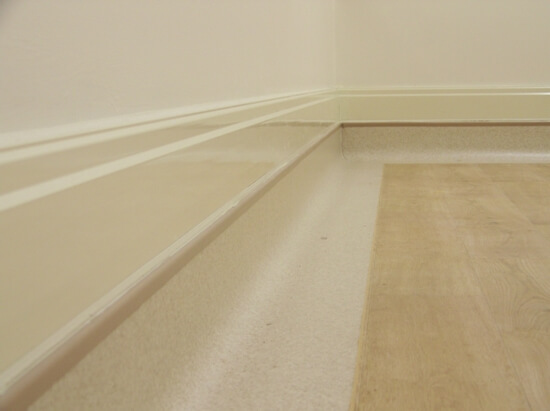 ThermaSkirt replaces the skirting trim and radiators in one to provide an energy efficient radiant panel that is simply wiped clean when the floor is mopped, saving on cleaning cost as well as eliminating the super bugs from the hospital. 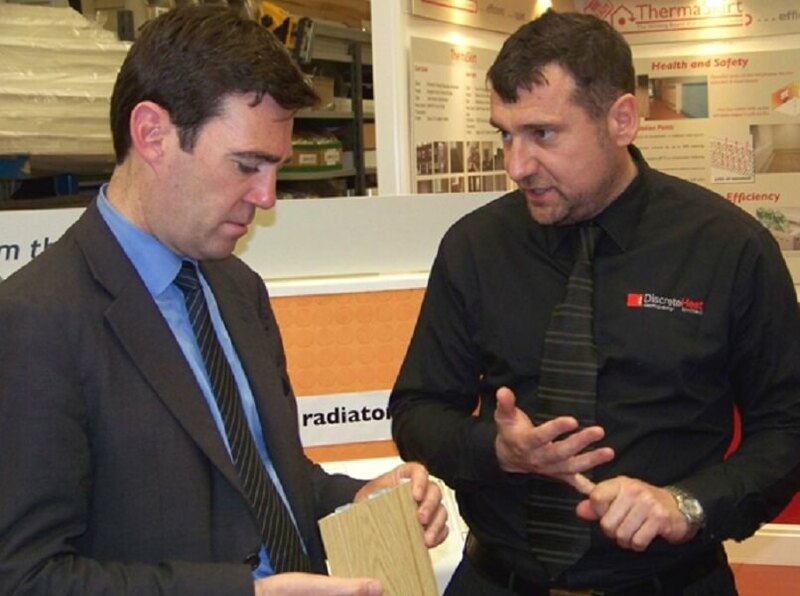 Andy Burnham said: "This is a fantastically well designed, locally made product that could really benefit the NHS. I am very serious about helping Discrete Heat achieve a greater awareness and up take in the health service". Also on the factory tour was Lee Panter, from the NHS Technology Adoption Centre. "I can see real benefits, both in terms of patient care and improved running and maintenance costs with the ThermaSkirt system. I am very optimistic that NTAC can bring the product to the attention of the people that really need to know about it – Infection Control & Estates Managers. This really is a no-brainer for the NHS". ThermaSkirt can also improve energy efficiency as it can operate at much lower flow temperatures than conventional radiators, allowing the heating system to reduce running costs by as much as 20%. 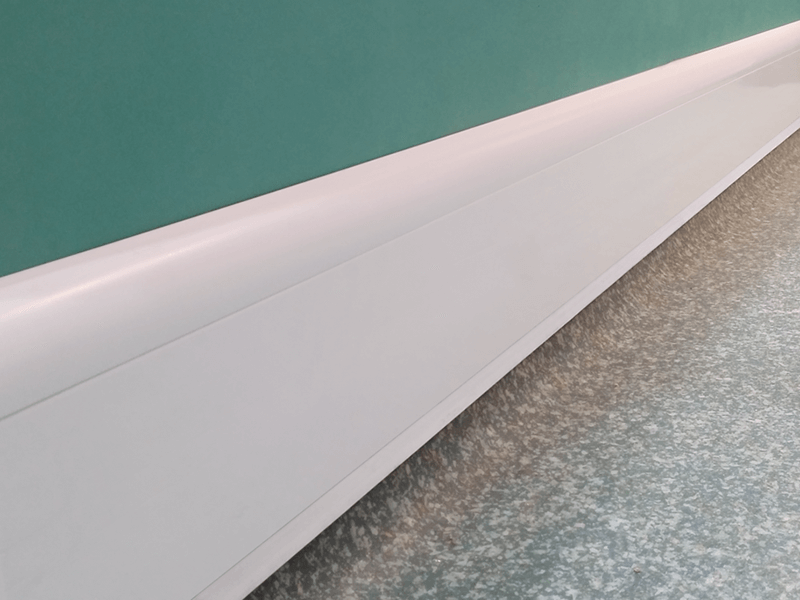 Additional benefits include eliminating the space robbing and potential impact hazards of bulky radiators and their safety covers that are commonplace in the wards, corridors and treatment spaces in hospitals. 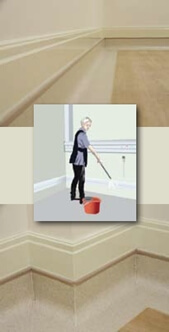 ThermaSkirt can be cleaned as part of the floor cleaning process - any time of night or day. Can be cleaned whether or not the heating is on or off – no special handling is required. 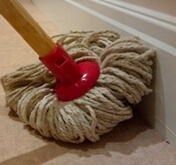 No dismantling covers – simple mop down with 1% bleach solution. Most wards (20m2) done in under 2 minutes - labour and cost saving. No specialist tools or equipment required - no retraining required. No bending, stretching or lifting – reduced risk of injury. Lower flow temperatures - improved energy efficiency. No ligature points, sharp corners or exposed valves and pipes. ThermaSkirt has been independently tested by BSRIA to be at least 13% more efficient than a standard radiator system. This is because the heat is distributed around the entire perimeter of the room, and the larger surface area creates an even all round thermal environment. This more efficient heat distribution means that it can be run at lower temperatures, saving fuel costs and overall running cost of the heating system. Unlike traditional radiators, ThermaSkirt creates virtually no convection currents (air movement) that carry dust or particles. 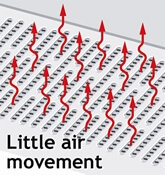 Radiators rely on convection currents to spread around their heat energy, but also create air movement that carry these particles around the room. This can be seen by the staining of the walls and wallpapers above convector radiators after a period of time – this is the dust and particles picked up by the air movement that can often trigger an attack in people with allergies and asthma or provide other respiratory problems. The grilles and fins associated with conventional radiators make them hard to keep clean and are seen as a health issue and potential source of infection in hospitals, schools and other public buildings. Radiant heat, as provided by ThermaSkirt, effectively heats the body not the room and as such creates a warm and healthy environment at lower operating temperatures. It's easy to clean lines and smooth contours make cleaning and maintenance straight forward. 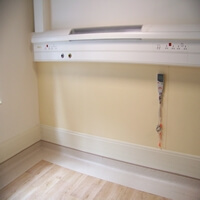 Conventional radiators and pipework provide an anchor point for those vulnerable people who would seek to self harm by suspension or ligature. 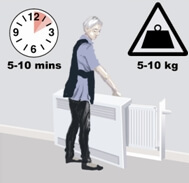 As a result, extremely bulky anti ligature radiator covers with performance sapping tiny air vents are required if people at risk are to be protected from themselves. Similarly overhead radiant panels, by requiring secure ceiling fixings have to undergo significant risk assessment and modification before they are suitable for use in high risk situations. Even then, their uncomfortable heating pattern –from the head down- exacerbate the feelings of distress that people at risk often feel. 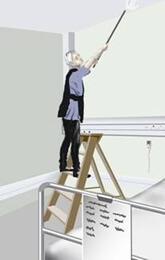 In addition, because of their position – literally out of reach – cleaning becomes a maintenance issue, not a cleaning task. Contrast this with ThermaSkirts smooth, clean lines, with no ligature points or exposed pipework. 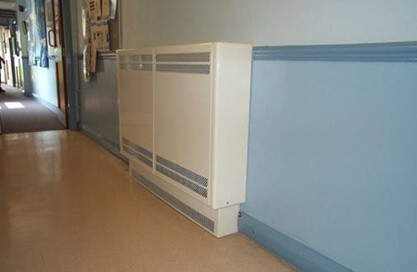 LST Radiators are often specified in hospitals & care homes, because they are perceived as being ‘safe’. However, investigations by several PCTS have discovered that the very covers that are designed to protect patients from burns and scolds may be contributing to the spread of infection and adding £millions to the maintenance costs – money the NHS badly needs to save. Deep cleaning of radiators takes at least 1/2 hour per LST radiator. Even at only £10/hr that is £4,000 per day. Or £1,460,000 a year! As a result, LST radiators are very rarely cleaned properly. 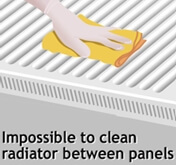 This leads to the build up of detritus inside the covers, and more importantly between the skins of the double radiator – which are impossible to clean thoroughly. Even radiators with drop down covers cannot overcome this fundamental flaw. Compare this to a ThermaSkirt installation that only requires a mop over when the floors are done with the normal cleaning solutions and requires no special tools or training. Radiators are difficult to clean, and create the perfect warm environment that harbours dust and propagates infectious bacteria. Although there are ‘cleanable’ Low surface temperature radiators, these still cause major problems, and do not enable complete eradication of harmful microorganisms. "Eventually, it was observed that each of the radiators was surrounded by a ‘cage’ that was fixed to the wall, making removal difficult. As a result, routine cleaning behind the cage was not undertaken. On investigation, thick dust and dried faecal matter was found behind the cages. Microbiological testing of this material indicated the presence of C. difficile. Teare et al (1998) noted that the outbreak began when the radiators were turned on in November and postulated that thermal convection from the radiators may have played a part in disseminating spores to vulnerable patients." Teare, E., D. Corless, and A. Peacock, Clostridium difficile in district general hospitals. Journal of Hospital Infection, 1998. 39: p. 241-245. 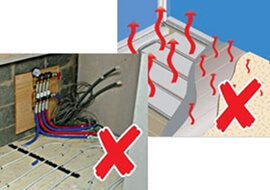 It is impossible to control it quickly leading to over & under heating. 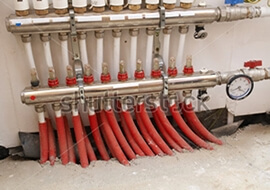 There are many cases of Care Homes and hospitals with underfloor heating, where the major complaint is over heating. The heating of small spaces with variable occupancy levels and inconsistent periods of activity is hard to control, especially with the UK’s fickle weather patterns to contend with. This is especially true in care homes where corridors provide the conduit for the feeds to each room and so are often massively overheated and impossible to shut off if the rooms the pipes serve are calling for heat. 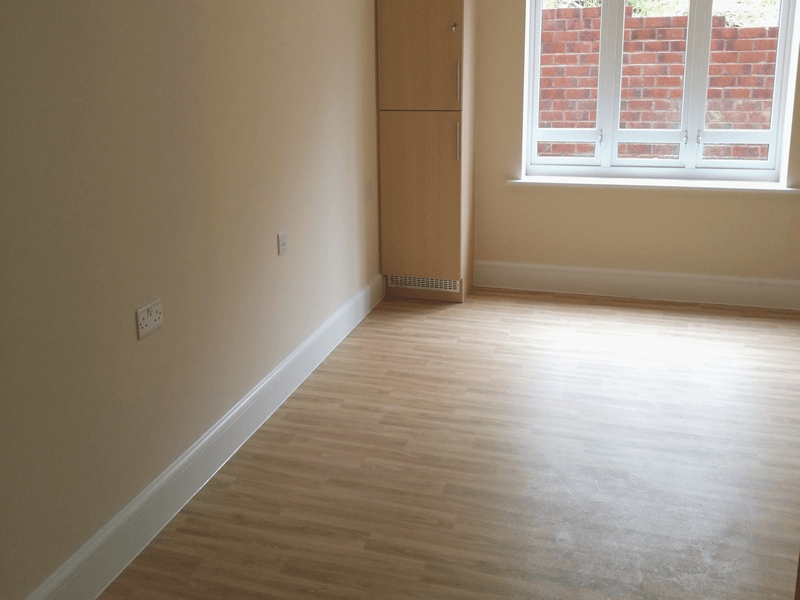 In many instances, this requires the staff to open windows and doors to expel the heat – hardly energy efficient as the energy used to store up that heat in the concrete screed has already been paid for. 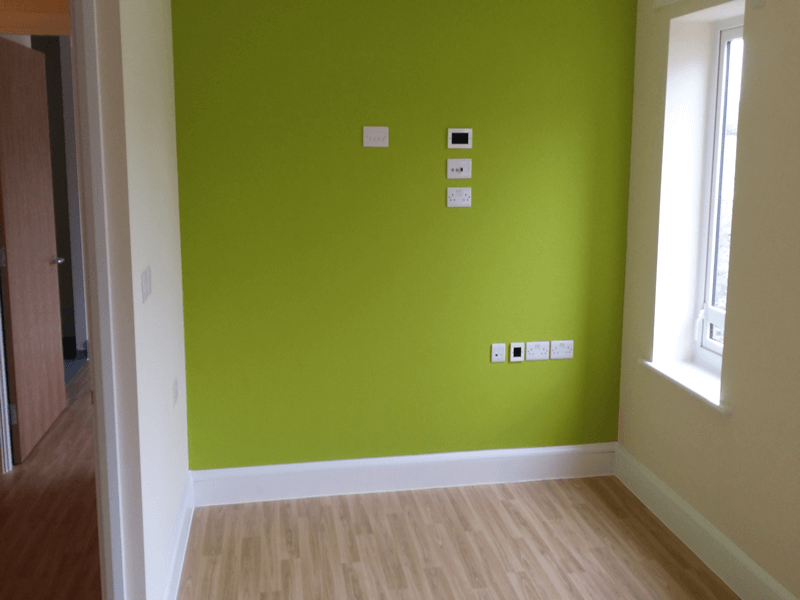 In addition, special ‘low tog’ floor finishes and carpets need to be used if the performance and response of the UFH is not to be diminished, which can add hidden £000’s to the cost of the project, even without the cost of skirting boards being added back in. Finally, the inevitable ‘accident’ means that the carpets are cooked from below adding to that unpleasant ‘care home smell’ that so many conscientious operators are anxious to avoid.